Figure 4 Representation of the anterior, medial and posterior roof arc concept. 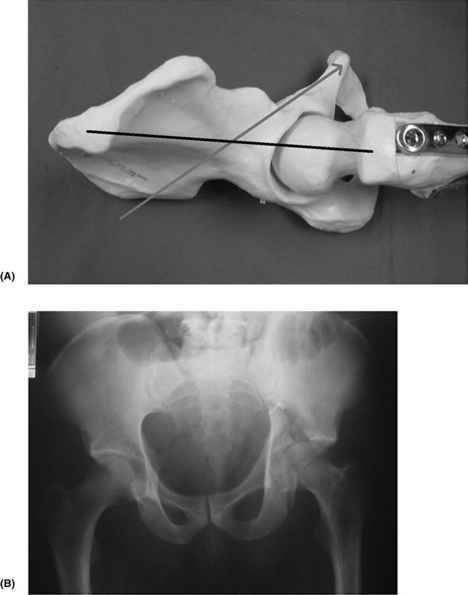 during the posterior approaches to protect the sciatic nerve; (vi) the use of the fracture table to facilitate surgical approach and reduction of the fractures; and (vii) the first comprehensive collection of long-term clinical outcome data regarding open reduction and internal fixation of acetabular fractures. Computed tomography was introduced in the 1980s and was widely championed by Mears and others (34-36). Tile continued to build on the work of his mentor George Pennal (37). He made significant contributions to the field of pelvic and acetabular surgery (38). Over the past 20 years, a variety of authors have contributed widely to the field of acetabular fracture surgery. The multiple authors have described these procedures as tro-chanteric osteotomy or variations of extensile surgical exposures for acetabular fractures (39-41). The prevention of treatment-related complications, neuropalsy, pulmonary embolism, heterotopic ossification, and so on, have also been described (42-44). These subjects are covered in later chapters in this book and will not be described here in detail. 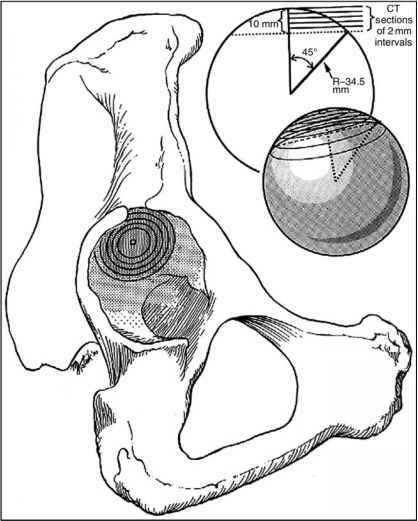 Roof arc measurements were further defined with the development of the computed tomography subchondral arc (45). This measurement describes the use of the normal bony anatomy of the superior acetabulum as visualized in computed tomography to provide an equivalent measure of the roof arcs. As such the study determined that the superior 10 mm of the acetabulum represents the equivalent area of a roof arc of 45° (Fig. 5). 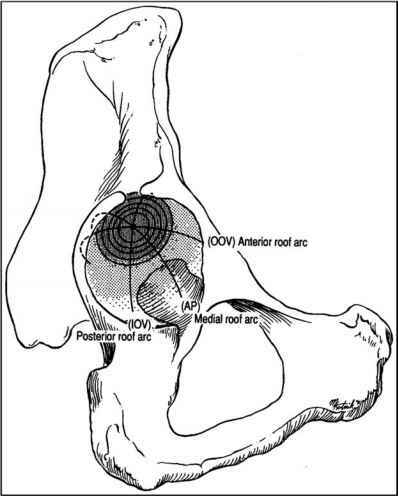 The current treatment recommendation for nonoperative management would include: (i) that the superior 10 mm of the CT subchondral arc are intact; (ii) that the femoral head remains congruent with the acetabulum on the AP and two 45° oblique views of the pelvis taken out of traction; (iii) there is no low associated posterior wall fracture of substantial size (greater than 40-50% of the wall); and (iv) that intraoperative stress views demonstrate no evidence of femoral head subluxation (45,46). Figure 5 Representation of the roof arc concept with CT measurement to define the subchondral ring. Letournel advocated an approach or protocol to treatment of acetabular fractures that includes extensive study of the X-rays to understand the anatomy of the fracture pattern and subsequent correct classification followed by appropriate operative positioning of the patient whenever possible to operate the fracture through a single surgical approach. Emphasis has been placed on obtaining an anatomic reduction of the articular surface. Long-term clinical outcome data suggest that the more accurate the articular reduction, the greater the likelihood for an improved clinical outcome of the patient's hip joint (47-50). Other authors have advocated protocols with multiple approaches, either simultaneously or consecutively, as a routine approach for certain types of acet-abular fractures (51-53), while others have advocated the use of manipulative closed reduction with percutaneous fixation techniques for certain types of acetabular fractures. The published data of clinical outcomes from surgeons who follow Letour-nel's protocol remain the most consistently successful.